Modest PSU at a great price. Power supply makers would love it if you spent a fortune on 1,000W or higher model, but the truth of the matter is that most systems don't anywhere need that much wattage, even those with dual graphics cards. 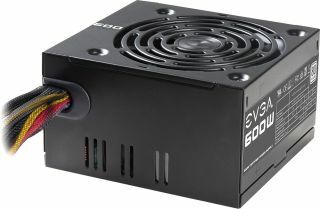 Depending on your setup, a good target is around 600W, and it just so happens that Best Buy is currently selling an EVGA 600W PSU for $35. That is about as low as it gets for a name brand PSU with the same or similar wattage and features. There might be some generic PSUs that cost less, but we wouldn't recommend wasting your time with those—many of them are cheaply made with bloated specs. It does not include fancy amenities such as modular cabling or LED lighting, though the wires are sheathed with braided mesh and there is plenty of wattage for most systems. It also utilizes a single +12V rail (49A). Best Buy offers free shipping or store pickup on the discounted PSU, which you can find here. It's backed by a 3-year warranty.